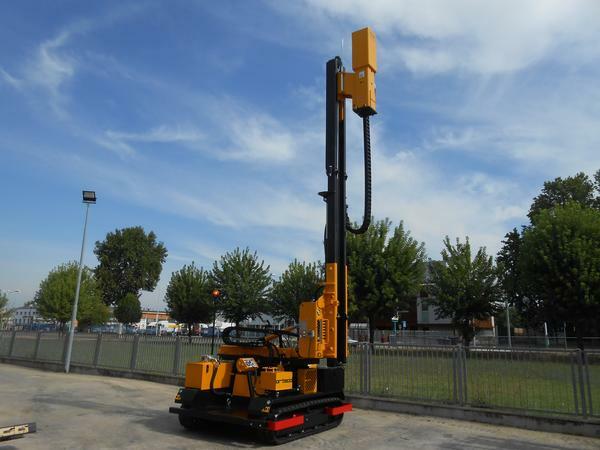 The crawler mounted self mobile Piledriver HD 1500 5 mt, is a machine intended for piling works for photovoltaic projects. With the Piledriver Orteco HD 1500 5mt we have increased the piling power by using a hammer with an impact energy up to 1500J, to be able to drive large posts in an hard ground conditions, main characteristic of this product is the possibility to drive posts with a total max length of 5 mt. This machine allows you to drive posts with great precision thanks to its stability and easy handling. A single operator drives and moves the machine. Our design allows the piledriver to be remouved for the crawler and be mounted on the back of a truck, so that our costumers can use tha most appropriate mahine for every job, and also allows costumers who already own a piledriver to purchase the crawler only at a later date.